A narrator who insists he is not writing the novel in your hands. A character who vehemently objects to being a character, at least in this – “really cheesy” – novel. And a troop of literary “salonists” – die-hard book-clubbers with a penchant for overanalyzing – who stray from discussions of Proust into vain attempts at extracting meaning from the very pages in which they appear as characters. 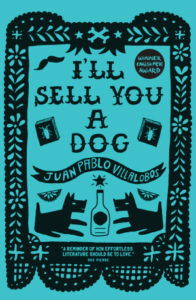 One zany conceit after another hatches from the riotous ouroboros that is Juan Pablo Villalobos’s third novel, I’ll Sell You a Dog, translated now into English by Rosalind Harvey. But in this farce, the joke may be on the reader along with the cast of eccentric characters: the book dares us to make sense of the narrator’s disappointing life, his unpleasant memories, and the twisted strands of canine motifs and references coiling through nearly every episode, even while playfully mocking that all-too-human compulsion to order the chaos of personal fate. The narrator, Teo, is a seventy-eight-year-old curmudgeon living in a Mexico City retirement community. Erstwhile taco seller and painter manqué, Teo spends his time calculating the number of days that remain in his life against the number of beers he can afford (though he always exceeds his daily allotment), concocting elaborate schemes to rid his apartment of cockroaches, flirting with his neighbor Francesca and the greengrocer Juliet, using his copy of Adorno’s Aesthetic Theory to ward off visitors, and generally passing judgment on every unfortunate soul that happens to fall into his orbit. Who knew retirement could be so eventful? Teo’s wry appreciation for the ironic sets up a narrative structure resembling the sitcom, replete with quick-fire dialogue and punchlines strategically positioned at the end of every “scene.” But it is Teo’s reminiscences, interleaved between slapstick routines, that form the backbone of what would otherwise be a disconnected, albeit hilarious, plot, and give flesh to this straight man, this aloof chronicler of the absurd. Through scattered flashbacks, we learn that Teo, the son of a failed painter, abandoned his studies at Mexico’s elite art school, La Esmeralda, alongside some of the country’s most famous artists, to support his mother. Working his way to becoming Mexico City’s preeminent taco seller, Teo must conform to society’s image of a street laborer by hiding his intellectual leanings. All the while he is haunted by the ghost of his former classmate, the Sorcerer, a brilliant painter who died on the streets after failing to achieve recognition for his work. The reader senses that it is not the Sorcerer Teo mourns but his own frustrated ambition. Nevertheless, Teo, ever the unreliable narrator because of his own self-delusion, fears recounting the memories which intrude on his daily life. Hence his insistence that he is not writing a novel. Never mind Francesca’s dogged belief that his journal constitutes a work in progress, as she repeatedly sneaks into Teo’s apartment and steals pages for analysis in her literary salon. Never mind the Sorcerer’s appearance in Teo’s dreams, urging his former classmate to write about him. And never mind the promise Teo made to his father, to have his ashes mixed into a famous artist’s paint so he can live on as a literal work of art – ignored in practice yet ultimately fulfilled if one considers that through memory Teo gives his father eternal life as a part of this work of art, the one we are reading. Thus, much as Teo desires to flee understanding, to avoid making sense of his memories, he finds he cannot because the simple act of remembering animates the characters surrounding him. “You haven’t changed a bit,” I told her. Teo’s conversation with Marilín foregrounds the cat-and-mouse game this novel plays with its characters and, by extension, with readers. This Marilín is not the “real” Marilín but a character in Teo’s theater of memory, a simulacrum of the person whose life diverged from Teo’s frozen conception of her and went on to live her own existence in a completely separate aesthetic universe. She is, in fact, a character of a character, nestled alongside historical personages such as Diego Rivera and Juan O’Gorman, who also make appearances in I’ll Sell You a Dog. And so we are left with a conundrum: do we root for our protagonist to write the novel, surrender to his latent need for meaning-making – that essentially human function which also compels us as readers to ask, “What is the symbolism of all these dogs?” – or do we hold the book at a distance, bow to its repeated efforts to remind us that it is a novel and therefore a too-tidy imitation of so-called “real” existence, if there even is such a thing beyond our remembering of it? The novel’s ending, with its decided schmaltz, would seem one more finger in the eye, for it gives I’ll Sell You a Dog its perfect aesthetic unity, all without answering any of Teo’s own questions about his life, maddening both reader and protagonist alike. Other reviewers have praised the novel’s biting social satire. Indeed, I’ll Sell You a Dog careens across vast swaths of sociopolitical territory, covering such issues as class, poverty, gender roles and bureaucratic ineptitude. Nevertheless, much of the political commentary will be a mystery to those outside of Mexico, as the joke often hinges on its audience’s familiarity with recent Mexican political history. Despite the book’s immediacy, its ability to stand at a distance and capture contemporary issues in perspective (no mean feat for any writer), as well as the voices of the characters, in particular that of Teo, will endure long after these issues have passed into dusty irrelevance. Here Rosalind Harvey’s translation achieves pure magic: it manages to be simultaneously fleet of foot – negotiating the intricately choreographed, colloquial dialogue with aplomb – and freighted with existential yearning – effortlessly capturing the unapologetic erudition and deadpan humor Teo wears like a suit of armor riddled with chinks. And this is what so beguiles in I’ll Sell You a Dog: that, like Teo, we cannot protect ourselves, we cannot avoid falling for that cosmic joke that constitutes being, even when we already know the punchline. Because to live without remembering, without making meaning, is not to live at all. Amanda Sarasien is a writer and literary translator whose stories and translations have appeared inThe MacGuffin, MAYDAY Magazine and FLAPPERHOUSE, among other publications. She also reviews at the sites Reading in Translation and The Mookse and the Gripes.